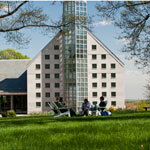 Unlike most seminaries and theological schools, The Andover Newton Theological School—the nation’s oldest theological school and first graduate institution of any kind, located in Newton Centre, Massachusetts—organizes the building blocks of a theological education into distinct “competencies” students will need to be effective faith leaders. Examples of such competencies include “forming, leading, and sustaining faith communities with a theological and spiritual understanding of the Church’s mission in a changing world” and “demonstrating relational competencies embodying multicultural, racial, ethnic, gender, and interfaith understanding.” With funding from the Science for Seminaries project, Andover Newton will equip students with a new and exciting competency: “speaking with intelligence and authority about the intersection of science and theology, both historically and in today’s world.” The new emphasis will incorporate science into two of the core requirement courses: Systematic Theology and Christian Ethics. As the first step in a multi-step program, two professors from each of the two core disciplines will build science into their courses for the initial school year. As a second step, an all-faculty retreat will be held at which the project leaders will share their experiences and encourage others in the faculty to include science in their courses as well. The final step will be a campus-wide event for the whole community at which local scientists and the project leaders will present their experiences and generate enthusiasm for continuing conversations about science and theology. At the end of all of this, the academic dean will oversee an assessment process in order to make the teaching of science part of Andover Newton’s permanent core curriculum.